One of the few things growing more rapidly than the Eastern Pacific sea surface temperature anomalies in recent weeks has been media speculation regarding the future evolution of El Niño conditions in the equatorial Pacific Ocean and potential meteorological impacts upon various regions around the globe. Given the recent explosion in interest regarding El Niño and its potential effects upon California in particular, I’ve attempted to summarize some of the most important aspects of the developing event and the science behind it. While this discussion is by no means exhaustive, hopefully it provides a helpful starting point in navigating what appears increasingly likely to become a rather interesting year from a global climate perspective. “El Niño” is the name scientists have given to the episodic warming of the equatorial Pacific Ocean. This ocean warming—which recurs irregularly every 3-7 years or so—leads to major shifts in atmospheric circulation over the Pacific Ocean and subsequently has a profound effect upon global weather patterns. Under typical conditions, northeasterly and southeasterly “trade winds” meet one another (converge) near the Equator. These low-latitude winds exert a westward force on the ocean surface, pushing water toward the western part of the Pacific basin that eventually piles up near Indonesia. At the same time, this warm, westward-moving water at the ocean surface is replaced by much cooler water upwelling from deeper layers of the Pacific Ocean off the coast of Peru. 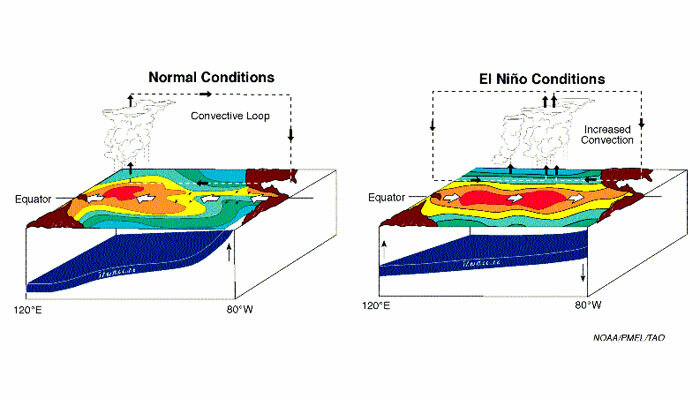 El Niño schematic from NOAA/PMEL. For this reason, there is usually a west-to-east temperature variation in Pacific Ocean surface temperature (and consequently in the overlying atmosphere): warm in the west, cool in the east. Winds in the atmosphere are fundamentally driven by spatial variations in temperature, and in this instance the “warm west” and “cool east” pattern is self-reinforcing: it favors the continuation of east-to-west winds along the equator, which (in turn) help to maintain the pre-existing west-to-east temperature pattern. Occasionally, however, this pattern of prevailing east-to-west trade winds weakens dramatically or even reverses direction entirely. The scientific community still doesn’t know for sure why these trade wind disruptions occur in the first place, but it’s pretty likely that they occur at least somewhat at random. Regardless of the initial cause, however, weakened trade winds allow the warm water that piles up in the West Pacific during non-El Niño years to “slosh” back toward the east. As this occurs, the usual west-to-east atmospheric temperature difference is reduced, and a new self-reinforcing feedback loop is initiated: easterly winds weaken further, allowing warm water to move even further east, and eventually shutting off the cold water upwelling near the Peruvian coast. Once this occurs, a full-fledged El Niño event is underway, and in most cases will continue until the warm water “reservoir” in the West Pacific has depleted itself (which typically takes 6-12 months). How can El Niño affect weather outside of the tropics? In an average year, powerful tropical thunderstorms occur rather frequently over the West Pacific as warm, moist tropical air converges in the lower atmosphere and is forced to rise. As this rising air cools, water vapor condenses in the upper atmosphere and releases latent heat into the surrounding air. 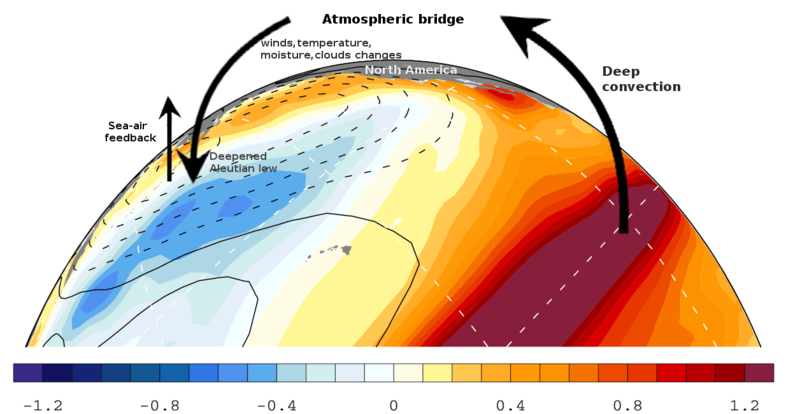 This upper-atmospheric heating causes waves to develop in the high-velocity river of air known as the jet stream, which tend to propagate northward and eastward from the tropical West Pacific all the way to the extratropical North Pacific—a phenomenon known as the “Atmospheric Bridge.” Upper-atmospheric waves such as these are responsible for most of the day-to-day variations in weather we experience in the middle latitudes. “Atmospheric Bridge” schematic from Wikimedia Commons. What are the effects of El Niño in California? As it turns out, this is a surprisingly difficult question to answer. The complexity of the answer stems largely from the fact that El Niño of similar intensity can exhibit very different spatial patterns of sea surface temperature anomalies and therefore result in drastically different atmospheric teleconnections around the world. For California specifically, one of the most important factors in characterizing the likely effects a particular El Niño event (or whether a well-defined set of impacts even exists) is the longitude at which the maximum ocean warming occurs. In general, however, El Niño impacts in California become larger and more predictable for events in which the ocean warming is centered in the far East Pacific. A key point to remember, though, is that El Niño does not guarantee a wet winter in California. In fact, there’s even some indication that certain Central Pacific El Niño events may even lead to drier-than-average winters. For illustrative purposes, however, and because there is evidence that we’re currently headed for an East Pacific-centered event, I’ve included the below narrative describing the impacts of a hypothetical, well-defined East Pacific El Niño event. This scenario represents my own informal distillation of numerous scientific papers focus on the topic, though unfortunately the figures from nearly all of these are unavailable for general reproduction on a blog such as this one (but that’s a discussion for another day). Note: this is not a specific prediction for 2014-2015! Warm local sea surface temperatures along the immediate coastline of western North America may be associated with above-average atmospheric temperatures in California during canonical East Pacific El Niño event. This mechanism of warming would preferentially warm overnight temperatures and temperatures near the coast, and would not necessarily be associated with increased incidence of heat waves or extreme high daytime temperatures. However, it may make those heat waves that do occur more uncomfortable due to increased humidity in the lower atmosphere and decreased overnight cooling. Another secondary (but potentially important) warm season effect of a strong East Pacific-centered El Niño is an increase in the number, intensity, and geographic range of tropical eastern Pacific tropical cyclones (hurricanes). These types of storms—which are fueled by very warm ocean temperatures—cannot develop anywhere near California (even in strong El Niño years) due to the presence of the rather frigid California Current. However, hurricanes that develop off the west coast of Mexico can become quite powerful, and if upper-level wind patterns are favorable one of these storms can occasionally take a northward or even northeastward track toward California as it (rapidly) weakens over cooler waters. 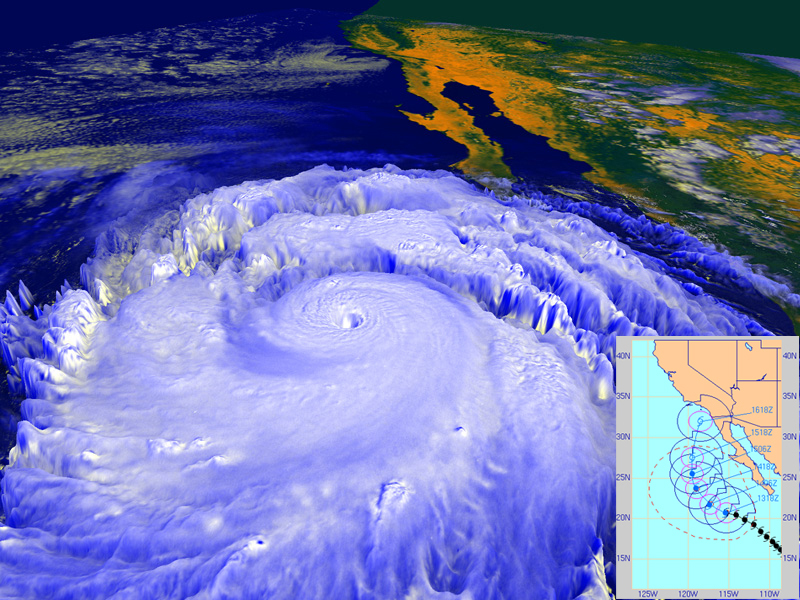 Hurricane Linda made an unusually close approach to California in Sep. 1997 (via NASA). It would be exceptionally unlikely for an organized tropical system of any strength to make landfall in California (though it’s not impossible). On the other hand, there have been quite a number of instances when the remnants of an East Pacific hurricane brought unusual warm-season precipitation to some portion of California. During a strong East Pacific El Niño event, sea surface temperatures off the west coast of Mexico are much above average, which increases the potential for such an event to occur. The probability of this happening would be highest during the late summer and early fall. A strong East Pacific El Niño event would likely strengthen the subtropical branch of the jet stream just west of California during the canonical wet season. This would direct the storm track squarely into Central and Southern California, most likely leading to above-normal precipitation in these regions (and perhaps in far Northern California, as well). In addition, the occurrence of individual high-intensity storms and rainfall events would probably be higher than during a typical winter due to the proximity of the storm track to California. Thus, the risk of flooding may be higher during such an El Niño event, especially in Southern California. Cool-season impacts of El Niño (via NOAA). Cool-season temperatures are a bit tricky, as the enhanced cloudiness associated with active storm track would allow for less solar heating to occur during a typical winter, leading to cool temperatures on most days. On the other hand, strong west-to-east flow would might act to inhibit the occurrence of cold air outbreaks associated with a high-amplitude, north-south oriented jet stream—making frost/freeze events less likely. Thus, winter temperatures may be near average overall (but with fewer very cold days). 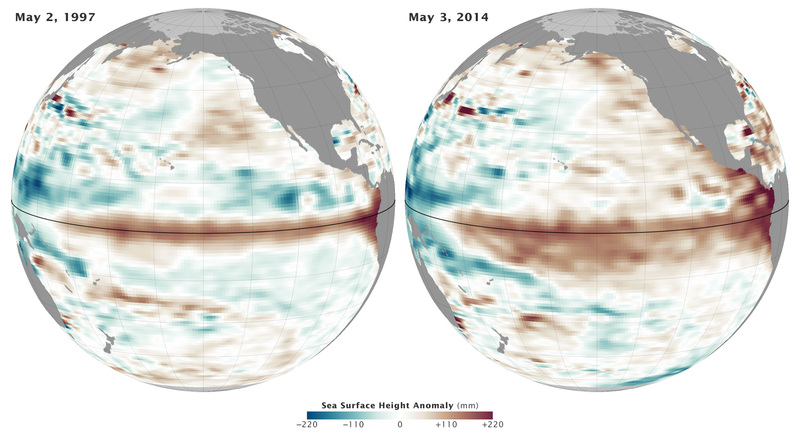 Over the past several months, the Pacific Ocean has transitioned rather dramatically toward an El Niño state. An powerful oceanic Kelvin wave—the strongest since a similar event in 1997 which preceded the very strong 1997-1998 El Niño event—made its way eastward across the Pacific Ocean during March and April and has now surfaced in the far East Pacific west of Peru and Ecuador. Sea surface temperature anomalies have increased rapidly in this region over the past two weeks, with warm anomalies now extending across the entire equatorial Pacific. The current spatial pattern, temporal evolution, and magnitude of sea surface temperature anomalies greatly resembles that which occurred in 1997. The overall volume of warm water associated with the current event in the Pacific actually exceeds that during the 1997-1998 event by a considerable margin. Additionally, the atmosphere has apparently started to respond to the recent surface ocean warming, with easterly trade winds continuing to weaken across most of the Pacific basin. There is evidence that a new Kelvin wave may be forming in the West Pacific, which (if true) would make further warming in the East Pacific essentially inevitable by mid-summer. Recent observations certainly point toward the continued evolution toward an El Niño state (and very recent observations suggest that we’re nearly there already). Numerical ocean-atmosphere models—which are used to make predictions regarding the state of El Niño months in advance—are nearly unanimous in projecting the development of full-fledged El Niño conditions by late summer or early fall 2014. Many of these models depict a pattern of sea surface anomalies suggestive of an East Pacific-centered El Niño event. Based on the available observational evidence and current model forecasts, it seems exceedingly likely that El Niño conditions will officially be declared later this summer. The magnitude and spatial character of the present ocean temperature anomalies suggest that a strong El Niño event remains possible this year, and additionally may be an East Pacific-centered event. A stronger statement—especially regarding possible impacts in California—would be unwise at this point, since we’ve yet to emerge from the infamous “Spring Predictability Barrier” that severely limits the accuracy of El Niño forecasts prior to the early summer months. I’ll be following this event closely on the California Weather Blog as it develops over the coming months. Stay tuned! « Record-breaking May heat and extreme fire weather conditions prevails; Ridiculously Resilient Ridge Returns?